This May, hours after Israeli Defense Forces (IDF) killed more than 60 Palestinians attempting to breach the border fence that separates them from their historic homeland, a group of young Palestinian Americans erected another wall, on the other side of the world, in downtown St. Louis. The St. Louis region is home to roughly 5,000 Palestinian Americans. Roughly 100 people had assembled here, donning a mix of St. Louis Cardinals baseball hats and the black-and-white checkered Palestinian scarves known as keffiyehs, some with a drawing of the Al-Aqsa mosque printed on their tips. The third holiest site in Islam, Al-Aqsa sits in Jerusalem, a city that the Israeli government bars non-resident Palestinians from entering. Organized by the newly formed Missouri chapter of American Muslims for Palestine, the gathering saw Palestinian Americans taking action in one of the largest cities in the Midwest. 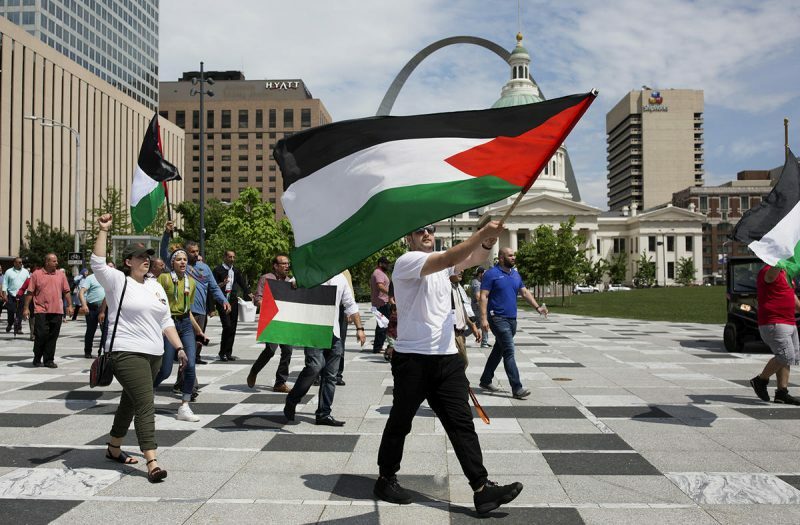 The St. Louis region, according to Ferrahs Abdelbaset, president of the board of a local mosque supporting the demonstration, is home to roughly 5,000 Palestinian Americans — a population greater than in many of the remaining Palestinian villages, he points out. The event was initially intended to commemorate the 70th anniversary of the day in May of 1948 that Israel calls its founding day and Palestinians remember as a catastrophic mass expulsion, or “the Nakba,” which saw the destruction of 400 Palestinian villages, according to Israeli scholar Ilan Pappe, and the creation of 750,000 refugees, per figures from the United Nations. But with the mass shooting of unarmed civilian demonstrators in Gaza the day before, the gathering also served as an emergency protest, connecting the historical dispossession of Palestinians to the present moment. Belt was on hand for the demonstration, and spoke to a number of participants about what it means to be a Palestinian living — and protesting — in the American Midwest. Their comments have been edited for length and clarity. 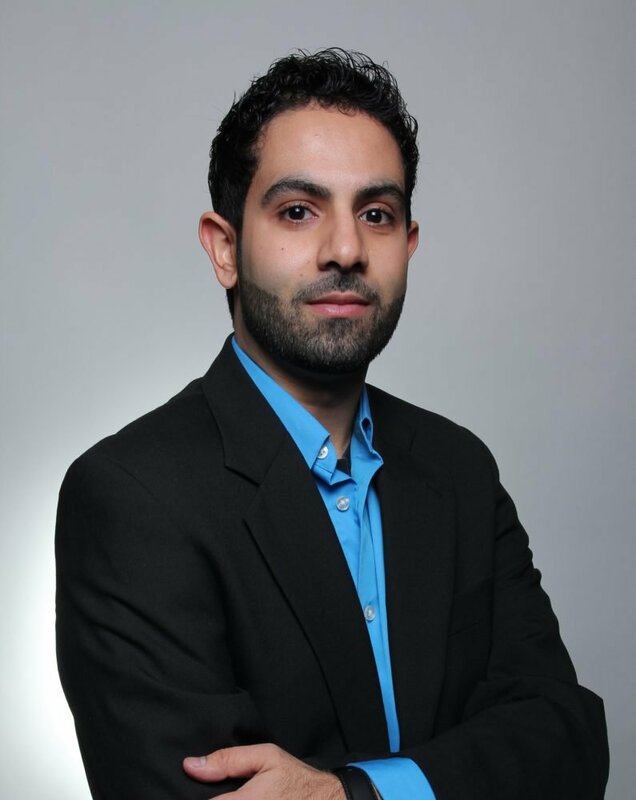 Ferrahs Abdelbaset, 37, is a father of three and a chiropractor, born in Chicago and raised in St. Louis’s multiracial North County, where his current practice is based, as is the mosque for which he serves as president of the board. He attended his freshman year of high school in Jerusalem from 1995-1996. Upon returning to the U.S. as a 15-year-old, he came of age spending his time after school and on weekends in Ferguson, Missouri, where his father owned a corner store and, later, a beauty supply store. In what Abdelbaset calls “the uprising,” the store burned to the ground during the protests that occurred after prosecutors announced they would not charge the police officer who shot Mike Brown, an unarmed black teen, in 2014. I lived in East Jerusalem for a year. I had some friends that were Jewish — Americans, too. They were living there because their family sent them over there, just like my family sent me over there, to immerse in the culture and stay out of trouble. One was from Chicago, so we had that Midwest tie. Plus the rivalry — the Cardinals versus the Cubs. We always wanted to hang out. You just don’t ride the bus. You couldn’t ride the bus. Before I went, I used to hang out at my dad’s store. 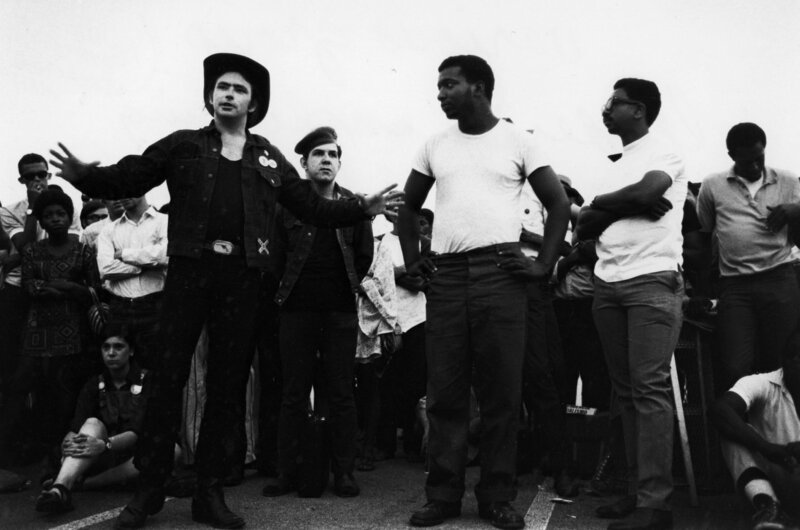 That was in an African-American community and I had a lot of friends in that area. We’d go play baseball. On the weekends, I’d be at the store with them. I used to notice that I was treated more white than black. If the cops came up, everyone would run except for me. Because where do I gotta go? They wouldn’t even bother me. When I came back from the Middle East, I started seeing some parallels. It was almost like I’m Jewish when I’m in St. Louis and the African Americans were the Palestinians. That’s how it was in the north side of St. Louis. It felt like Palestine, if you were dark-skinned. I was so immune to it. In Jerusalem, it was somewhat of a conditioning. When I look back at things, sometimes I say to myself, “Man, I shouldn’t have just let that be the norm for my community in Ferguson.” But there are those who stood up. There will be those who continue to stand up. Maybe one day I can be one of those. Our store actually got burned down during the uprising. It was conflicting because part of me, as a store owner, was like, “Man, did we really have to go through this, guys?” But part of me, it made me want to pick up a stone and throw it myself into my own store. I felt outraged that it culminated to having a young man get murdered. I can have these flashbacks of memories of innocent people getting harassed and pushed around for nothing. And then it boils up to the point where this kid has to get murdered. Did the kid really need to be killed or shot at? No, he didn’t. I took a brick from the building just to remember. I have it at home. I feel like we could’ve done better for the neighborhoods we’ve opened stores in, as a Palestinian community, than what we have done thus far. Not all of us. There are many business owners who have done good for the community. But the majority of them have not. That’s a stigma that’s very prominent in the “Arab corner store” genre, so to speak, in the St. Louis region: The Arabs come in to the neighborhood, open up stores, mooch off the neighborhood and then leave and they don’t put anything back into the neighborhood. There’s a certain part of the city you can open in. An Arab guy can’t open a store in West County. But, what you can do is open in the area you want to open in — and do something for that area. If we can get together and better the community here, that’s where we should focus. The Palestinian cause, while it’s important and dear to us, is part of a global cause for justice. We can’t isolate ourselves. We need to be a part of all of the global causes for justice — justice for anyone, anywhere around the world. I think that right there will have a better impact. Home is here, my heart is in Palestine. It’s a dual identity. I am Palestinian. And I am American. Neveen Ayesh, 25, was born in St. Louis and then spent her formative years in both the West Bank and the Midwest. 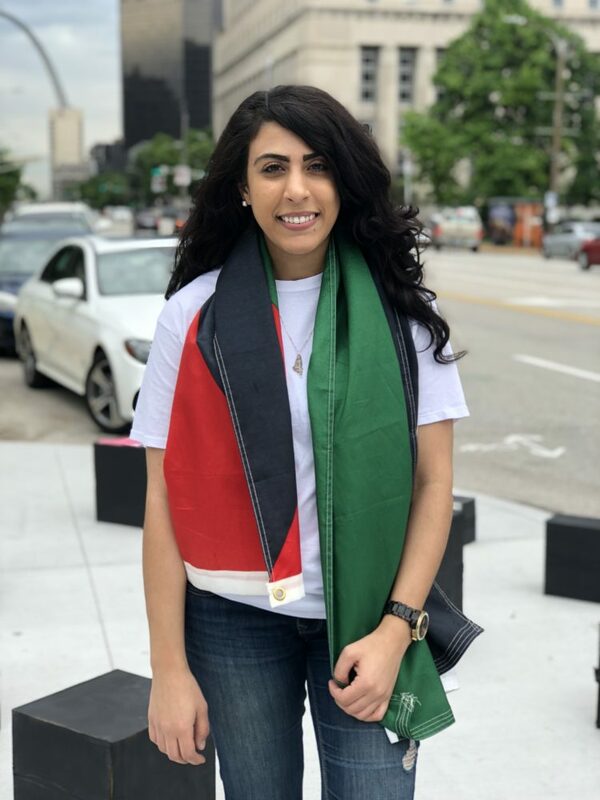 She is the executive director of the Missouri chapter of American Muslims for Palestine and hopes to run for political office in 2020. I have a very big love for St. Louis. Because this is where I’m studying. This is where I’m allowed to be able to go to school and work and build myself up without having to be interrogated by the IDF. With that being said, here in America, we don’t have clean water in all 50 states. We have so many homeless people. Health insurance is ridiculous. Our economy, up and down. We’re complaining about how our veterans are not being taken care of. We send a minimum of $3.8 billion out from our taxes to Israel every year in military aid. We’re funding their healthcare, we’re funding their education, we’re funding the occupation — at the expense of all of our tax dollars. We need to invest it in America first. So America can be its best before it wants to provide for Israel, which is using that money to build themselves up at the expense of Palestinian lives — depriving Palestinians of life itself. It’s wrong. And each and every American who pays taxes is at fault for that. When we say the word refugee and Nakba, they are intertwined with one another. A refugee is a person in my eyes who was not only kicked out of their homes but kicked out of their lives. It’s a segregated, apartheid country. When you’re controlling people’s water and electricity and natural resources and you’re not letting them vote in elections, that’s not a democracy. When you have a wall segregating Palestinians from Israelis, that’s not a democracy. While there’s two sides, they are not equal. One side has all the leverage and the other is just really suffering. Ahmed Bshara, 29, is originally from the city of Nablus in the West Bank. 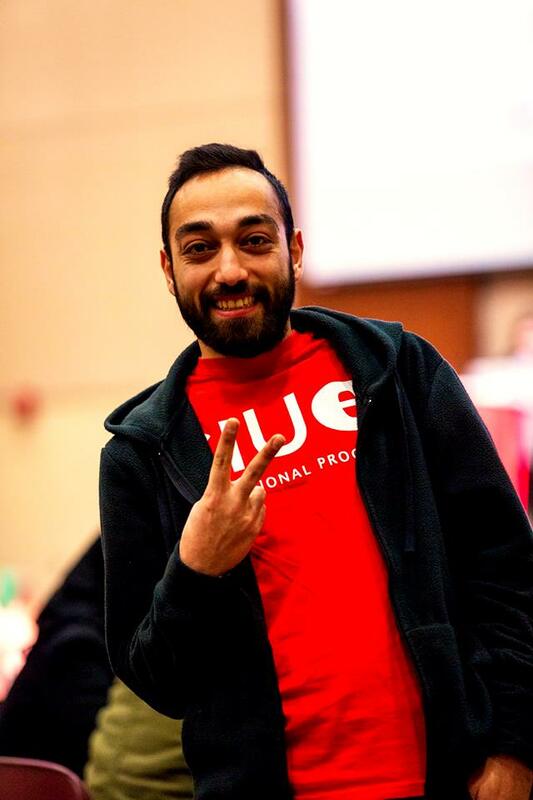 He is living in the St. Louis region for a second time, after a 2014 Fulbright scholarship brought him to Southern Illinois University Edwardsville, where he is again teaching Arabic. During his first trip, he met his wife, Lara Bshara, a Jewish American. I like the people here a lot. I like how people are very friendly. You can find anything here. For someone coming from Palestine, that’s a big thing: You can do anything you want. In Nablus, we have three main checkpoints around the city. You can’t go anywhere if you don’t have permission. You can’t be free. You can’t do what you want. There are a lot of restrictions on every single aspect of your life. People from Gaza and West Bank can’t visit each other. We have the Mediterranean there. It’s a big thing for Palestinians: “I want to see the sea just one time before I die.” A friend and I, we thought of going. But there’s no possibility we can get a permit. It’s just going to be rejected. What we did is that we went there illegally — we didn’t have permission. Just to have a few hours there, to see the sea, make that dream come true, come back home, that’s it. On the way back before we got home, an Israeli police car stopped us. They knew we were there in Tel Aviv without a permit. Just because of that, we spent two weeks in jail. It was humiliating. They’ll push your humanity to the limit. This is inhumane. That’s the kind of stuff you don’t hear in the media, that you don’t get unless you live there. A lot of people have no idea what’s going on. They hear one thing and build their whole perspective on the issue from that. That’s pretty damaging. Because the narrative in the media is Israel is doing the right thing, there’s nothing wrong there, and I hear a lot about that from people: Israel is just defending themselves. I guess the point to take for people who don’t know a lot about it is to read more. 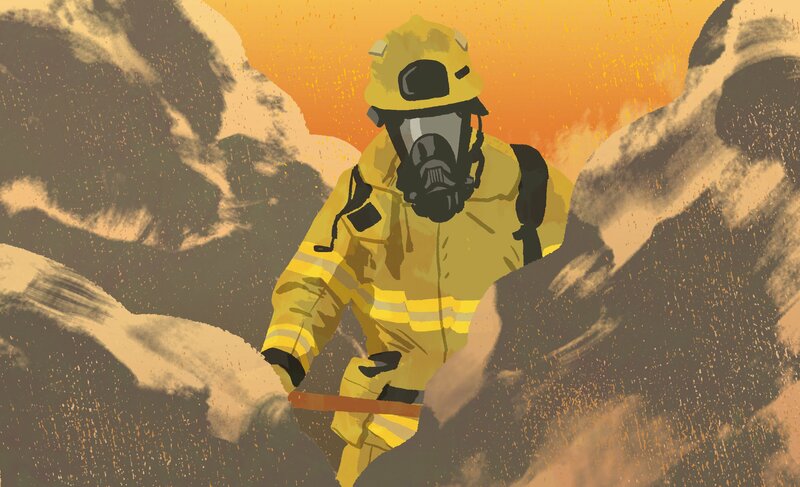 Don’t believe me, don’t believe anyone — just read more about it. I get it that it’s very complicated. Learn more about it and then you can go from there. You can’t have empathy for people you don’t know about. [And] the American government is a big main factor in the conflict there. As an American citizen, you do have, I believe, a moral responsibility to do something about it. My first time here, it was just for a year. I enjoyed it to the max, to the top. My second time now, it feels different. It’s very hard to be away from my family. In the background of mind, there’s always this thing that tells you, “Hey, your mother, your father, your friends [back in Palestine] might be dead.” That’s the biggest conflict inside myself. 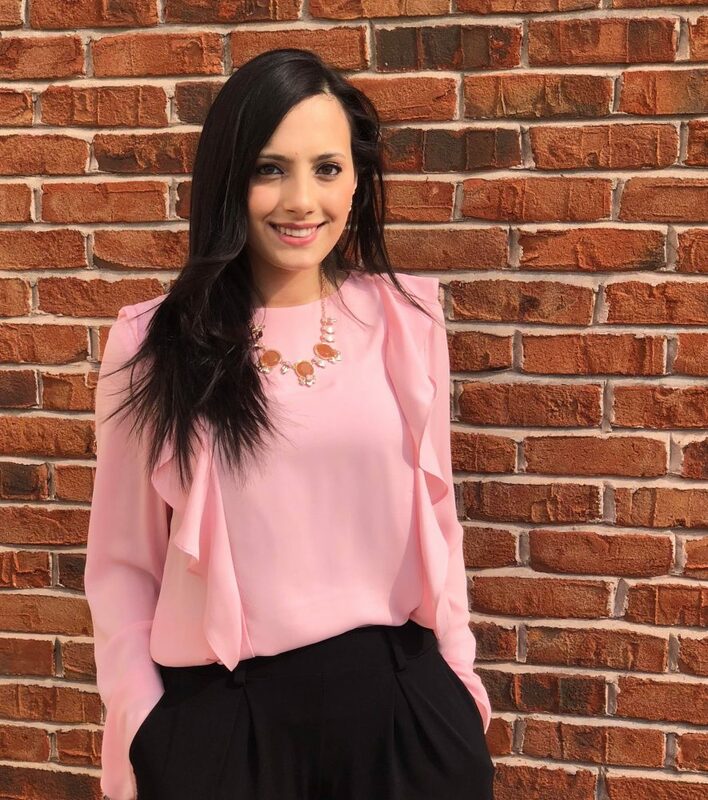 Jeneane Salameh, 24, is a financial analyst from St. Louis who grew up spending her summers in Palestine. Before 1948, her family lived as fig and olive farmers in Beit Nabala, a village that was destroyed in the founding of Israel. On extended visits to Palestine, Salameh has spent most of her time in the Jalazone refugee camp, where she attended a portion of second grade. An American with a Palestinian ID, Salameh is not allowed anywhere but the West Bank — unable to access Jerusalem, coastal cities and her family’s ancestral land. The way our family was removed, they thought it was temporary. They thought they would be leaving for a couple days. They heard about the massacres and they didn’t want to be next. They left things still on the stove, where they would make bread. [They left] their animals. They thought they could come back. They went to the neighboring city of Shukba. But after a couple years, they found out they could never go back. And that’s when they went to the refugee camp they’re still in 70 years later. My grandpa was in St. Louis International Airport today. Seventy years ago, he was 8 years old and expelled from Beit Nabala. And today he’s not going back, still to this day. He’s going back to a refugee camp. In St. Louis, it’s sad because a lot of people are ignorant of the situation we’re in. Maybe they’ll support us, personally, but they don’t support our people. How are we supposed to feel that people we go to school with, go to work with: They may like you, but they don’t realize that when they’re supporting Israel, they’re supporting stripping us of our rights, of our land, our identity? When we do see support, it’s very heartwarming because of how little there is. Even though we’re born here and identify just as much as anyone else as American, we feel that our eyes are open to social justice issues — for different types of people, not just Palestinians — because of what we’ve experienced. There’s definitely a bond between the events that happened in Ferguson and daily occurrences in the West Bank. In 2014, I had just left the West Bank, and that was when there was an uprising going down in Gaza. That was the last major offensive on Gaza — 2,000 people were killed. So, I’m coming back and feeling really bad for leaving my family in this situation and going back to a really easy life in America — and it was the same day in August that events unfolded in Ferguson. And for me it was insane to see the parallels with the tear gas being thrown at protesters and police attacking protesters, because that’s exactly what I was seeing in Palestine. I was never told to hate Israel. What I was faced with was looking outside, and I remember tanks coming down and I once saw a man getting shot and killed. I can remember when roads were closed to us and we’d have to walk. Checkpoints: I remember how terrified I was of the IDF, and how is a child supposed to feel when they have the occupation forces in every aspect of their life? There was always the presence of the Israelis. You won’t find a Palestinian who won’t have a martyr in their family, or their neighbor, or someone they knew. For us, there’s no saying, “We want to live in peace. Let’s just try to live how we are.” The situation we’re in, it doesn’t allow us to do so. The Gaza Strip has been suffering from over a 10-year blockade. Water is undrinkable. 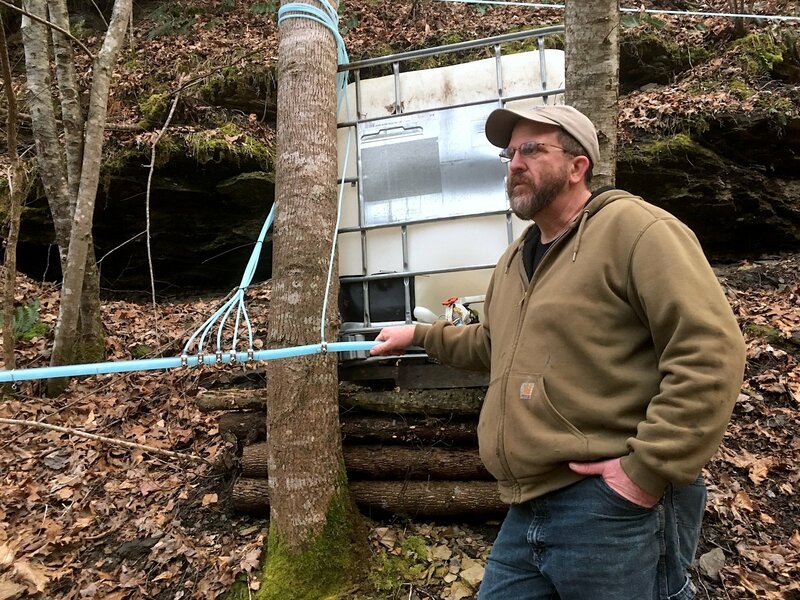 They’re lucky to have four hours of electricity a day, and at times they go days without it. The majority of the population are refugees, unemployed and reliant on humanitarian aid for food. Suicide is growing rampant, and for Gazans they see no difference between death and the current way they’re living. [Israel wants] a Jewish only state. That contradicts everything we’ve ever been told here in the U.S., that in America we don’t have a race, we don’t have an official religion, every individual, every citizen is treated equally. [Israel is] an apartheid nation. The only solution I see is a one state solution. One that doesn’t give a Jew more rights than an Arab, one that treats everyone equally. And, if you don’t want that, you can leave. But, I can tell you, the Palestinians would never leave. Sarah Macaraeg is an award-winning journalist, originally from St. Louis. Her investigations on immigration and policing have been featured in The Guardian, Reveal from the Center for Investigative Reporting, and VICE, among other outlets. You can find her on Twitter @seramak. Banner photo: On the 70th anniversary of the founding of Israel, or, as Palestinians call it, a mass expulsion from their homeland, Palestinians living in Missouri march through St. Louis’s Kiener Plaza, with the iconic Gateway Arch in the background. Photo by Carolina Hidalgo for St. Louis Public Radio.